I have been wanting to pen this post since morning, I did not want to rush it with the small pockets of time I had. I don't enjoy life on full throttle, I hate being rushed. Yet! there are moments where I do feel like a marathon runner. Busy does not necessarily translate to productive. I have come to realize that am a laid back kind of gal. Am sure my better half will not agree with it, he feels am over scheduled. I would just love to take my time to do things, but most often than not, things don't work that way. That's what I feel about the shot below, if I had not hurried myself and not multi tasked when taking the shot, it would have turned out much better.. the soup was awesome no complaints about that. On a cold cloudy day, it's just perfect. My idea is to sit down with my favorite music and enjoy the soup, while the world goes by. Need to uncluttered my mind and just do that, you know what, am doing that! Am taking the afternoon off, no electronic leashes, no household chores What are your plans for the weekend? 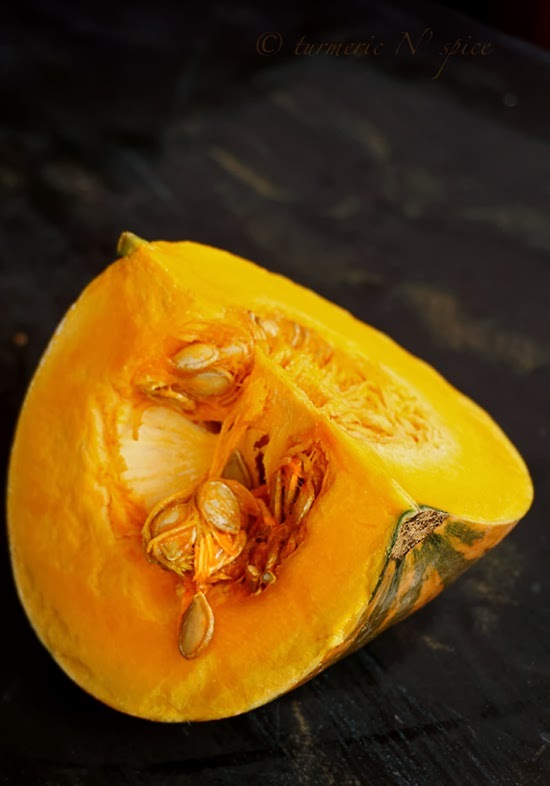 The idea of the soup was inspired from a blogger who mentioned about a thai influenced pumpkin soup. I just could not find the recipe... it set me thinking and am really happy with my take on it. Roast and grind into a fine powder. 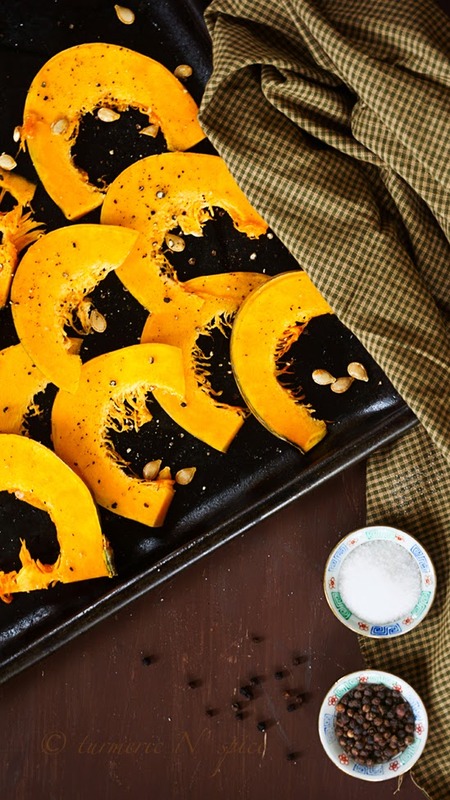 Slice the squash, roast them in the oven for 20 min @ 350F. After they have cooled a bit, remove the skin and grind into a fine paste. Mix coconut milk, squash paste,water if it's too thick and bring to a boil, add the red curry paste OR 1 1/2 tsp of curry powder, salt to taste, simmer, serve hot. Garnish with fresh basil or cilantro. My family loves thai food and they just loved this soup, so did I. It's going to be on my weekly menu list, for sometime. I cannot resist garnishing with chili flakes, but that is totally optional. 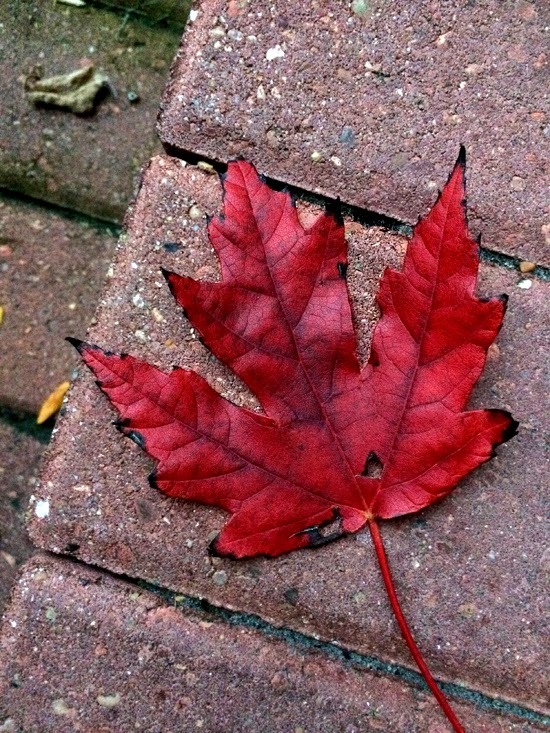 Got this beautiful red leaf from my morning walk. How can nature be this beautiful? Something to think about when am sitting there sipping my soup. 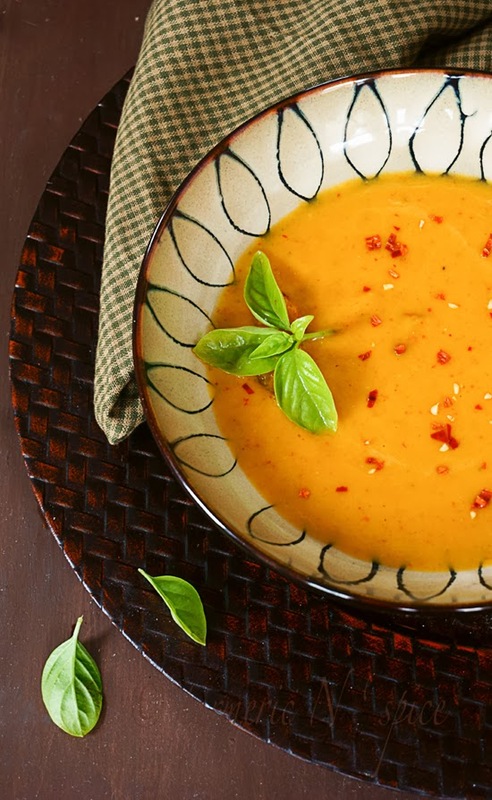 Delicious and colorful looking pumpkin soup. Lovely and delicious soup,i too posted pumpkin soup in my blog but a little variations in my post. a small curiosity do you used seeds also in this soup. Love the sound of this soup. I've been making a curried butternut squash soup - I need to branch out beyond butternut. This is just the perfect time for tons of soup...I keep thinking about it. I like the look of this delicious deep yellow colored soup ! A comforting and delicious soup! Wonderfully seasonal. Oh, what a gorgeous soup...perfect for autumn! And I love the spicy twist! I love the steam in the photo. It makes it feel alive. Those flavours in the soup must be sublime. 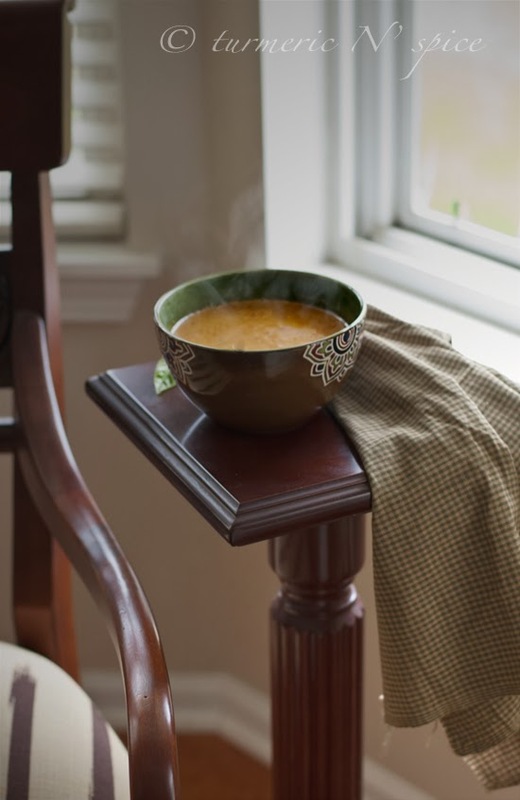 A beautiful soup and lovely photography. Thai flavors are some of my favorites. Pinning. Absolutely gorgeous! The soup, presentation and photos. Love it! A gorgeous soup, Simi. Love the color. Looks like a delicious soup (and photos are great)! It's so damp and chilly here, I could really use the spice and heat of this right now. Divine! 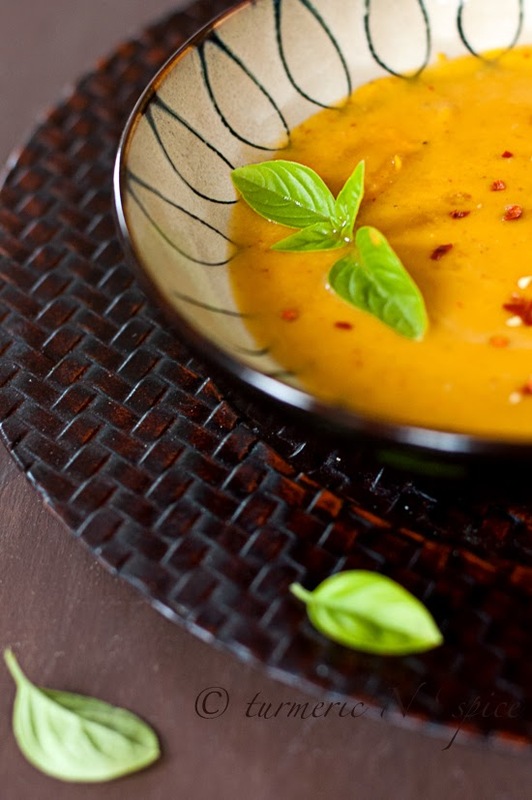 I love the fusion flavors of thai and indian ingredients for this soup! YUM!